Last night, I had no net connection so I missed this brilliant rant. 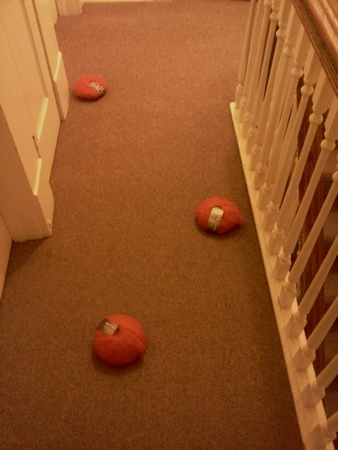 Cats can't stop their thievin'. Mondays are usually too frantic to permit me blogging time, today being no exception. 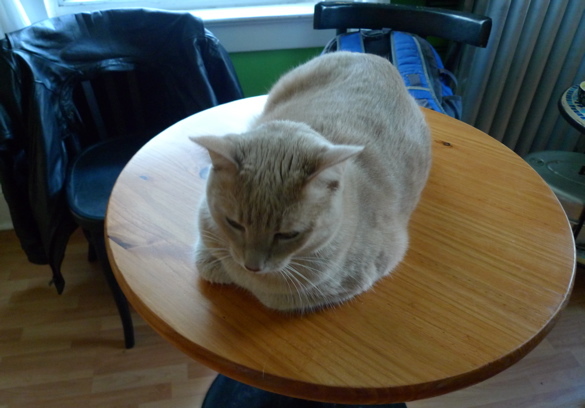 It’s hard to compose a thought as dinner’s in a minute and yoga class follows, but what are you gonna do? Sometimes thinking goes out the window and comes back in the screen door. This is how you can traverse the gamut of middle class American experience in the space of ten miles. Sitting with OccupyTrenton on a warm November afternoon. 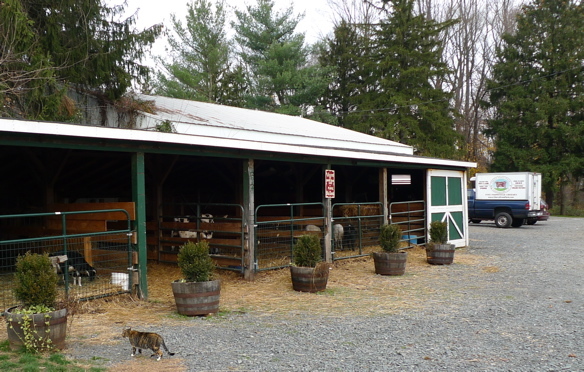 On the way home, we stopped at a farm, had sandwiches and fed the half-blind barn cat some brie and apples. Though clever Sweetpea looks placid in afternoon light, every morning we wonder if today is the day she figures out how the doorknob works. She knows it does. She just doesn't know yet how. is what happens when we experiment with new ingredients. 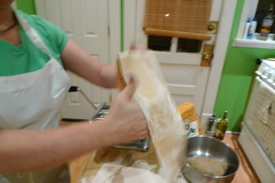 Specialty pasta flour is two parts Durham or All Purpose flour and one part semolina. When we couldn’t get pre-mixed pasta flour, we bought the best white whole wheat flour – also Hodgson Mills – because we want to cook with and eat whole wheat flour. The hard part for us has been acquiring good semolina, but we found a Greek grocery store carries semolina. We have trouble getting out of that store because the proprietor’s mother bakes olive oil cookies that smell like pillowy, cushiony, cocoa sin. 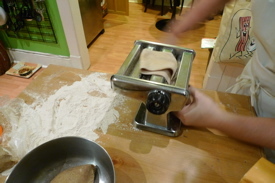 As an experiment, we tried mixing up a dough of two parts white whole wheat flour and one part hostage-free semolina in the Hodgson Mills Pasta Flour recipe. It rested overnight in our fridge and we went to work. I have small hands. We find that if we roll out a ball of dough that fits in my hand, about a quarter or third of a cup, we end up with a versatile sheet of dough. Immediately, I was surprised by the texture of the dough. It had a nice elasticity and rolled beautifully. The first thing you do with ravioli dough is the same thing you do with any pasta dough: roll it through the machine three times at the widest setting. 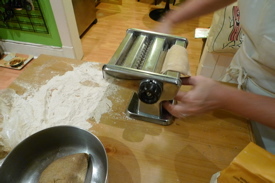 While it’s easier to roll dough with pointed ends, you want your sheets to have relatively squarish ends. All you have to do is fold up points as you’re rolling and you can avoid cutting off some extra dough and re-rolling – though you are going to cut off dough and re-roll. Let’s just say squarish is closer to what you want. Roll, roll, roll at the highest setting, fold in your pointy ends, then turn down your setting by two and roll, turn down your setting by two and roll, and turn down your setting by two and give it a final roll. If the lowest setting is 1, you want to end up on 2. 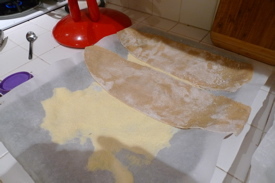 Place your rolled sheet on a sheet tray covered with parchment paper and liberally sprinkled with semolina. Roll out your balls of dough and lay out the sheets, but don’t put the machine away. You will be re-rolling. After some practice, you can make ravioli freehand, but I’m going to tell you straight up I have a way to go before I’ll be ready to make dozens of ravioli without a form. Here’s the form, generously dusted with flour. 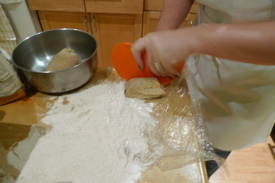 You lay a dough sheet over the form and press the dusted shaper over the sheet to create pockets for filling. Using a very small ice cream scoop or melon baller, pick up about a teaspoon of filling twelve times and place those teaspoons of filling into the pockets. We’ll talk about that filling in a minute. It’s the reason we’re talking about ravioli. Using a basting brush, moisten the border grid, drop a second sheet of pasta dough on top of the first sheet and filling. 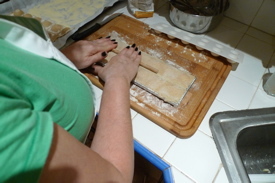 With a small dowel, roll to join pasta along the border grid. 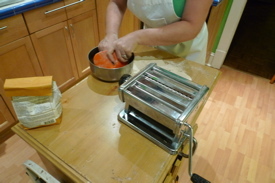 This joins the four corners of each ravioli and will help to separate the ravioli along their edges. Turn out the ravioli over the floured pan. Give them a few minutes on the floured tray to recognize their purpose in life. 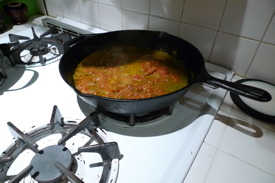 Pete used a jar of roasted tomatoes I jarred last summer, garlic, white wine, lemon zest and fresh herbs from our backyard to fashion an expert sauce that bubbled in a cast iron pan while he brought a large pot of salted water to a boil. 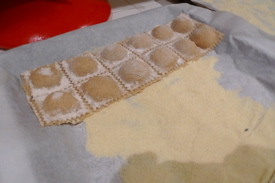 One batch of pasta dough makes more than we will eat for dinner, so we put three dozen ravioli onto floured parchment and froze it for another time. Pete boiled the ravioli until the pasta was tender. 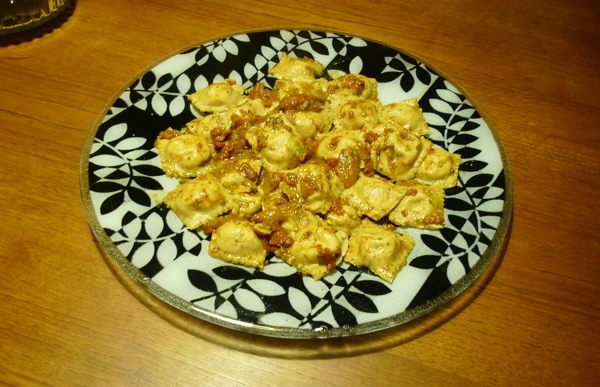 We tasted one and were thrilled, so Pete drained the ravioli and tossed them into the sauce before plating. Pete took pictures. Then we ate and made nom nom nom noises. This dinner started with about four or five ounces of leftover ground lamb. What can you do with it? 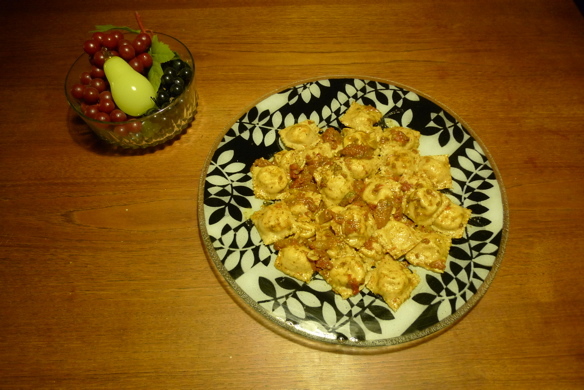 You can make a sauce for something or you can make ravioli, so we chose the pasta. We were thrilled with the two-flour pasta dough and mixed up a cannister of our own pasta flour, so we’re ready for awkward leftovers. Yes, that’s what we’ll say about it. We feel confident that we can handle awkward leftovers. 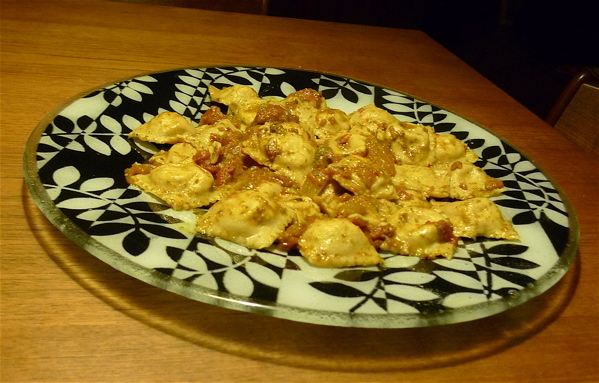 After you’ve made ravioli two or three times, you will be astounded how hard it isn’t. SCIENCE! Tasty, tasty SCIENCE! Hypothesis to follow. 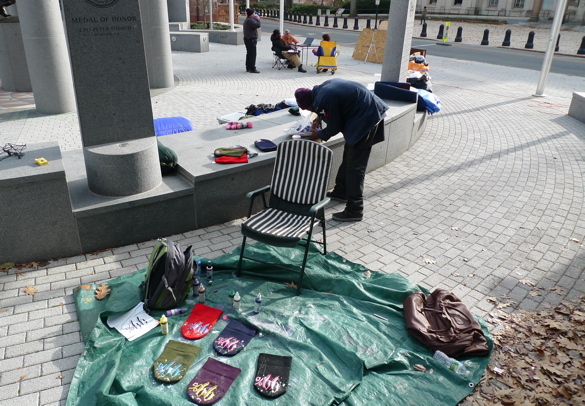 The Occupy the Highway marchers we saw nearly two weeks ago here in town arrived in Washington D.C. In other news, Miss and Mr. Sasha and the two sticky little grandchildren are driving from frigid Minot to cool, damp New Jersey just in time for additional coolness and dampness. This morning, they report from a location near Chicago. I’m exhausted, just thinking about it.